College romances and school crushes make for very good television shows, webseries, Rom-com movies and romantic fiction. The television audiences and readers like them for their lively quotient, humorous instances and lighter moments, with which all of them can relate. Also, there are the typical hindrances like unswerving families and other snags in the form of misunderstandings, but the overcoming of such obstacles and the validation of the invincibility of love leads to much cheer. The author Niti Chopra comes up with such a book “Ira Oberoi’s pursuit of love”, which is a young adult fiction and a very relatable read for college goers and youngsters. 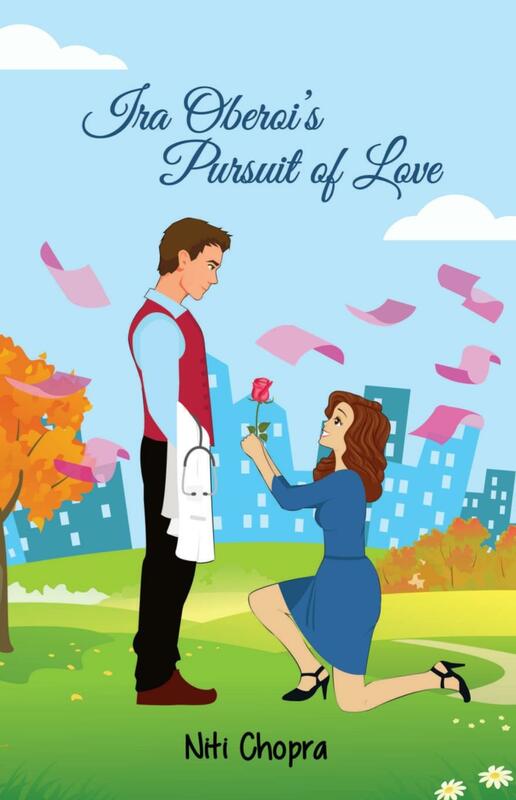 The book cover shows a pretty girl proposing a doctor, who’s looking sauve with his dashing smirk and a stethoscope and a doctor’s white apron as accoutrements. The light blue of the cover, along with additional hues of green, pink and auburn have a genteel and soothing effect. In short, the book cover is impeccable. The blurb at the back cover is lyrical and amazingly written with the right mix of rhapsody and mellifluous diction, and will persuade readers to pick up the book. The storyline follows the pursuit of love of Ira Oberoi. Ira is a fun loving girl studying in a medical college who falls head over heels in love with Raaghav. In this story, the traditional concept of the boy wooing the girl goes for a toss. Smitten at first sight, Ira boldly pursues her love interest. But her personal diary, in which she has described her emotions and feelings, falls in the hands of her mother who, on the verge of a cardiac arrest, forbids her from getting into a relationship with him. What will Ira do in such a situation? Will hers be a love story that finds it difficult to have a sweet ending or will it be the perfect fairytale to be remembered down the years? Will Ira Oberoi’s pursuit of love be successful? This is what forms the storyline. The narrative is simple, and apart from the usual complexities of love and the disapproval of the match by Ira’s mother, there are not much of twists and turns. The character formation in the book is good, but there were some cheesy lines which could’ve been done away with. Ira’s character is affable, and the way she unabashedly expresses her love to Raaghav is applaudable. Raaghav also brings a zestiness and certain distinctiveness to the story. This is a book that should be read for its refreshing take on a modern romance saga and for its exciting and piquant storyline. However, those who are looking for conventional serious love stories and mounting traditional melodrama should not go for it. This book is for those who want some tanginess and quirkiness in their romantic read, albeit with the narrative having elements of the usual difficulties that lovers face.